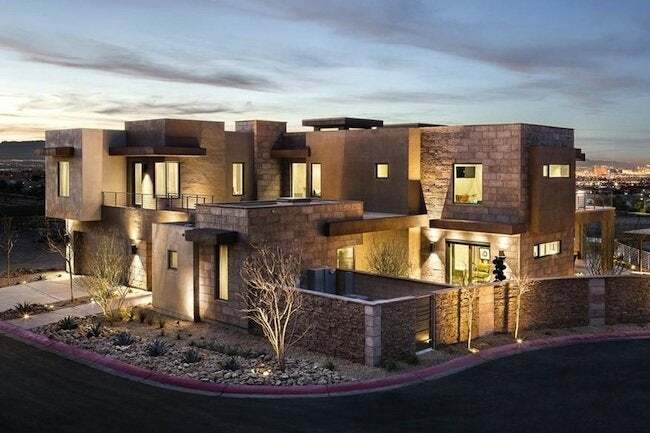 The 2014 New American Home showcases energy efficiency and sustainability while creating a luxurious, flexible, and comfortable environment perfect for today's families. 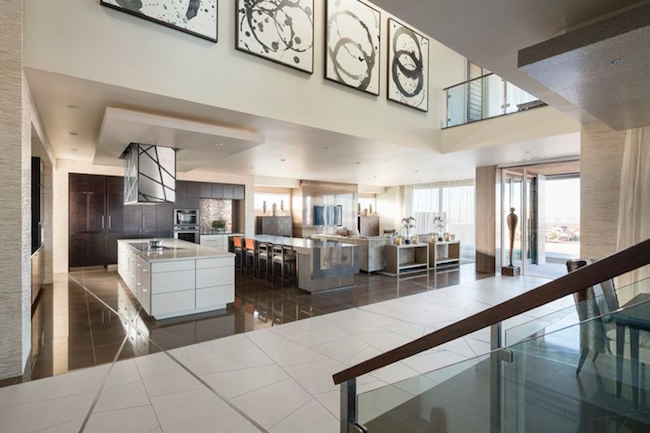 The New American Home for 2014, nestled in the foothills of Henderson, Nevada, is an “idea house” showcasing new trends in home design and construction technologies that was recently on display during the National Association of Home Builders’ (NAHB) International Builders’ Show. In their design for this 6,700-square-foot show house, architect Jeffrey Berkus and interior designer Marc Thee honored the natural elements of fire, water, metal, earth, and wood, while builder Josh Anderson, of Element Building Company, employed the latest trends in building science to bring their vision to life. 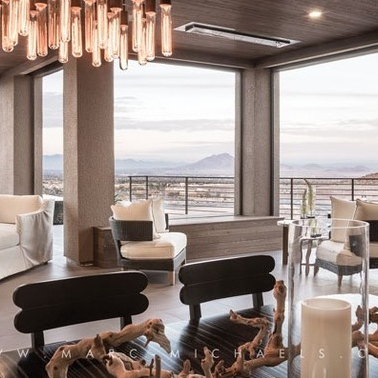 “The 2014 New American Home represents how people are going to live and what that might feel like,” explains Thee, who worked with Berkus to seamlessly integrate indoors and out and to take full advantage of the site’s jaw-dropping views of the Las Vegas valley. Mixing organic and modern aesthetics, they created a sumptuous setting for 21st-century family life. Although the New American Home is luxuriously appointed, one of the team’s foremost goals was practical: to achieve Emerald status under the National Green Building Standard. The first step toward reaching that goal was orienting the house to maximize natural light and solar energy while minimizing solar heat gain. During the building process, Anderson’s crew used sustainable materials as well as innovative building products. 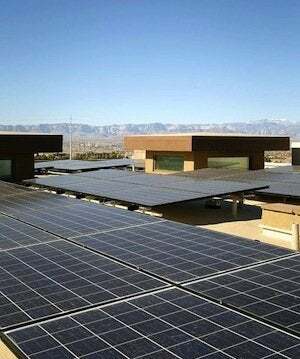 To harness the sun’s natural energy for powering the house, they installed photovoltaic panels on the roof. Embracing the notion that today’s families need flexible spaces, the design team included an attached “casita,” a self-contained suite that can be used as an office or guest quarters without requiring entry into the main house. A larger carriage suite can be accessed by the adjacent staircase or elevator. Both of these accommodations contribute to the multigenerational nature of the New American Home’s design, which provides housing options for in-laws or grown children who want to be nearby yet independent. Just inside the front door of the main house, a waterfall sets a calming tone as visitors proceed down the porcelain boardwalk that leads to the heart of the home. “The first floor was designed around an entry gallery where all the spaces are connected but have distinct qualities of their own,” says Berkus, in reference to the two-story space anchored by the boardwalk. To the left of the boardwalk, the state-of-the-art kitchen hosts two islands—one for cooking and a second for eating and homework. “Today’s lifestyle dictates open-living floor plans,” says Thee. “So, kitchens have to feel like part of your living space.” To both define and integrate the kitchen, Thee and Berkus eschewed walls and instead used design elements, such as lighting, floor coverings, wall finishes, and furniture, to create a subtle transition from the kitchen to the adjacent living room. Across the boardwalk, the dining area features glass walls that glide open into pockets, extending the interior space to the poolside terrace and outdoor kitchen. A floating staircase supported by a sawtooth stringer, an artful combination of wood and metal, leads to the second floor. One of the house’s two master suites is tucked beside these stairs and features a glass-and-stone bathing area integrated into the bedroom. Upstairs, glass railings surround the gallery overlook. A media room serves as a family gathering space and shares a private terrace with the expansive second-floor master suite. In this open-flow retreat, a two-sided fireplace partition separates the sleeping and bathing areas. Two additional family bedroom suites and a laundry room complete the second floor.